The last time we checked in with A.J. 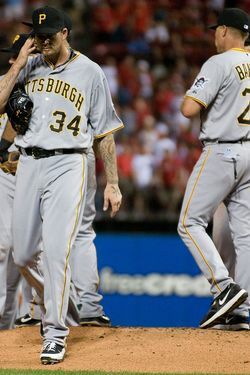 Burnett, he was giving up twelve runs in 2 2/3 innings. We all had a good laugh about that, but since then, it's been impossible to deny that Burnett has turned into the pitcher the Yankees always dreamed he could be. Last night he took a no-hitter into the eighth inning of a 5-0 shutout of the Cubs, and his ERA is down to 3.27. He's 13-3 on the year and has been a savior for a team that would comfortably have a wild-card spot if the season ended today. You were right all along: A.J. Burnett just never fit in the Bronx. It'll be fun when the Pirates and the Yankees meet in the World Series and he pitches at Yankee Stadium.